Started this cold spring morning with a smoothie...spinach, almond milk, banana, strawberry and blueberries. That combination of fruits made the smoothie a nice purple color...made me smile! Lunch was pretty standard for me...spicy thai kale salad with kelp noodles, carrot and apple salad and beets with macadamia ricotta...delish and very filling. I posted a picture of my kale salad on Facebook today and one of my friends asked me why is my kale always so shiny"??? I told him that I massage it with olive oil to soften the leaves...it's made with love. (smile) Doesn't everyone massage their kale...Do you??? My good buddy Lisa made this for Jennifer as she celebrated her 40th birthday again this year(an inside joke). Knowing that I would not partake in this big bowl of deliciousness, Lisa, being the kind hearted person that she is, made me my very own bowl of fruit...So sweet she is!!! I could not put another thing in my mouth after eating my filling lunch, so I brought the fruit home with me and had it for dinner. Hubby was out for the night so dinner was pretty easy for me...Socca Lovin' and a bowl of fruit, smothered in tahini dressing!!!! I am in love with tahini dressing. Recipe can be found on the recipe tab on my blog. This is my first a time participating in What I Ate Wednesdays, thanks to Kristina. So, check us bloggers out here WIAW...thanks for stopping by! 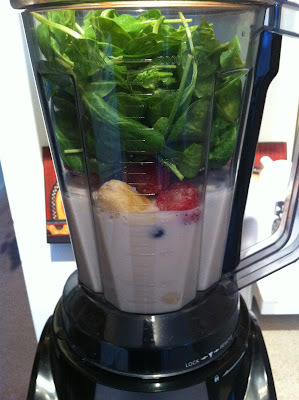 Here's a question for you...what's your favorite foods/fruits/supplements to put in your smoothie???? 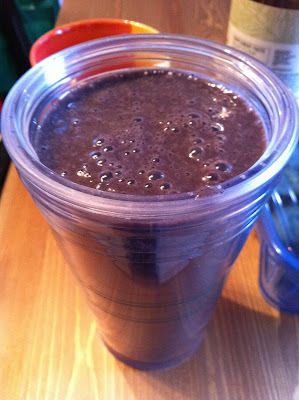 Anyone out there put Spirulina in their smoothies??? A Vegan is a Vegan...right??? First of all I would like to say how good I feel after finishing up 10 days 100% raw!!! "C" completed the challenge and he feels great too!!! Not sure if he will be a vegan, but I do know that his eating has changed and will continue to change...Thanks "C" for the continue support. The reason for the above title...I posted this video on Facebook and Twitter with the hopes that it would make people think a little about the foods they eat and how changing could heal their bodies. Maybe someone could have an "ah ha" moment. Posting this video got me thinking...Does Bill Clinton becoming vegan for his health and weight loss make him any less of a vegan...I mean, some people become vegan because of their love for animals. I became vegan for my health, initially, and through this journey I began reading and became more aware of the treatment of animals for human consumption and now I could not and would not eat another piece of meat or any animal product for that matter. I have never, ever, ever eaten an entire beet in my life...until now. I actually love them...RAW that is. I went to one of my favorite restaurants Great Sage and had what I always have, Raw California Rolls. You see that curly stuff on the right side, well those are raw beets. I tasted them and they were not bad. So I thought to myself...wonder how they would taste marinated in olive oil and seasoned. I have seen pictures of beet ravioli but actually never thought that I would try it because like I said earlier...I do not like beets. I guess that beets are like carrots to me, because I don't like cooked carrots either. I was excited and eager to give this recipe a try. Went to the grocery store, bought a beet. Only bought one because I was still a little skeptical. Not totally convinced that beets where my thing. Did a little research on marinating and creating with raw beets. Used my mandoline to slice the beets and marinated them in olive oil, sea salt and pepper. And it was delicious!!! Hubby liked them and my friend, Diane enjoyed them as well. They are stuffed with Macadamia Ricotta which is listed in the recipes on my blog. I am surprised by my love of these beets. Just more proof that cooking food not only changes the nutritional value but it also changes the taste! GoRAW! 10 days 100% RAW!!!! Bring. It. On. Kale Salad...Anyone who has read my blog or seen a post on my Facebook page knows that I love kale salad...I eat kale almost everyday! Not only is it delicious but it has oh so many nutrients. Anyone doing this raw food challenge needs to incorporate kale into their daily meals. It's nutritious and very filling! Another standard salad that I have in my fridge is a carrot and apple salad. This salad can be eaten for breakfast, lunch or dinner... Easy to make and yummy for the tummy!!! Another food that I have grown to love is Tahini...I make a dressing that is absolutely good on everything! One of my husbands stipulations of this challenge was that I had to prepare his lunch the way that I prepare mine...So that I did! So, I hope that this information helps anyone who is interested in this challenge or changing their eating habits... I have added more recipes to the blog also.